Shizuku's childhood friend and one of the Three Beauties of Seitetsu, she has many admirers, Natsuru being one of them. She has a large collection of stuffed Zōmotsu Animal dolls and likes to present them to her friends; those who receive the dolls, however, tend to end up becoming Kämpfers. 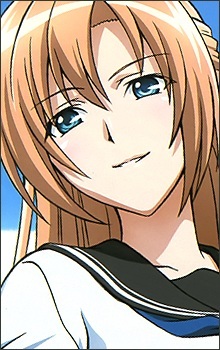 She began to develop a crush on Kämpfer Natsuru after being saved from Kämpfer Akane at the beginning of the series, later coming under the mistaken impression that the normal Natsuru is her rival for Kämpfer Natsuru's affection and consequently becoming somewhat hostile to him, a situation not helped after a misunderstanding in a very compromising situation leads her to think Natsuru is cheating on the female Natsuru. Later she is revealed to possibly have something to do with the appearances of the White Kämpfers and may be manipulating Natsuru. It is eventually confirmed on separate occasions when White Kämpfers swear loyalty to her and when, without possessing any bracelet so characteristic of Kämpfers, she wields both a Japanese sword and a Beretta 93R against the Red and Blue Kämpfers. It is also implied that she knows that there are not two Natsurus, but one that switches gender (she personally reveals it in the anime whereas in the novel it is her White Kämpfers who would do so). Do you collect anything? These anime characters do. And their collections are on the… bizarre side of things. Maybe you should keep your distance from these strange anime collectors and their selection of oddities.